HUNTINGTON, W.Va. – Junior guards Jon Elmore and C.J. 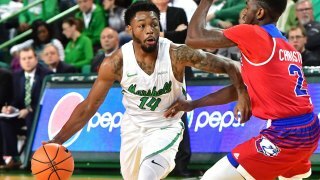 Burks combined for 55 points to help give the Marshall men’s basketball team a 78-65 win over the Louisiana Tech Bulldogs on Saturday evening at the Henderson Center. With the win, the Thundering Herd moved to 11-4 (2-0 Conference USA), while the Bulldogs fell to 9-6 (0-2 C-USA). The win also moved Marshall to 10-0 at home for the second consecutive year to begin the season. It is the first time the Herd has started the season 10-0 in back-to-back seasons since the 1972-73 and 1973-74 seasons. Elmore led all scorers with 32 points, while he added nine rebounds, five assists, one steal and one block. Burks scored 23 points, while he pulled down four boards and dished out four dimes. Freshman guard Jarrod West added 12 points thanks to shooting 4-of-7 (57.1 percent) from three-point land. Louisiana Tech’s Jacobi Boykins led his team with 15 points. Both sides began the game with a slow start, as neither team made more than one field goal after four minutes of action. From there, neither side pulled away from the other. After the Herd went up, 21-19, La. Tech went on an eight-point run to make the score 27-21 with 6:28. From there, Marshall went on a 10-2 run with Burks and Elmore scoring all 10 points. Marshall did not give up the advantage for the rest of the game and closed out the half with a 36-31 lead. The Herd held the Bulldogs to 40.7 percent shooting from field goals, but only shot 2-of-7 (28.6 percent) from three-point land. In the second half, with Marshall leading, 54-50, the Herd went on an 11-point run with five minutes to play. The comfortable lead held for the rest of the game, as the Bulldogs did not overcome the deficit, while Marshall won, 78-65. In the second half, Louisiana Tech shot 11-of-29 (37.9 percent) from FGs, while the Herd short 14-of-30 (46.7 percent) from FGs and 4-of-8 (50 percent) from three-pointers. Marshall will welcome the WKU Hilltoppers for its lone contest of the week on Saturday, Jan. 6, at 7 p.m. at the Henderson Center.